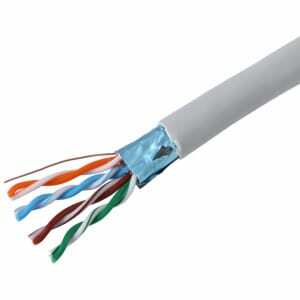 Copper braid shield — The cable has a small gauge copper wires braided into a mesh around the cable core. Typical coverage ranges from 65 percent to 98 percent. For medium-frequency applications (1 MHz to about 100 MHz), braid shields are often used. Foil shield — foil shields are constructed of a metallic (typically aluminum) foil with a 1/2-mil thick polyester backing to increase mechanical strength. The shield can be overlapped with the foil facing in or the foil facing out. A drain wire is placed in contact with the foil side of the shield to provide easier grounding of the shield at cable terminations. Spiral (serve) shield — these shields are typically constructed with bare or tinned small gauge copper wires that are helically applied in a flat or ribbon configuration. Spiral shields range in coverage from 80 percent to about 97 percent. These shields are used primarily in audio, microphone and retractile cord cables where extreme flexibility and a long flex-life are required. For low-frequency applications (up to about 1 MHz), braid or spiral wire shields are often used.